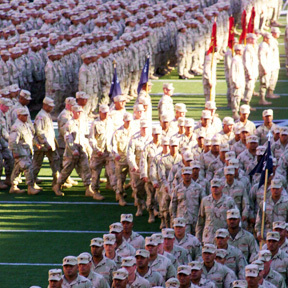 10 WHO MADE A DIFFERENCE » Soldiers marched off the field after a ceremony for the Hawaii Army National Guard's 29th Brigade at Aloha Stadium before the group left for Iraq. "It was so incredibly big, we thought it was a baby humpback whale," said Jimmy Hall, owner of Hawaii Shark Encounters. Hall and his crew soon realized that the animal was not a whale, but a great white shark, 18 to 20 feet long. A report to legislators charging an absence of fiscal accountability is met testily by UH. The ABC series, made in Hawaii, won television's Emmy Award for Dramatic Series in its freshman year. Punahou loses in the final of its holiday classic after Spencer McLachlin loses his footing. Hawaii's visitor industry, which brought in a benchmark 7 million visitors in 2005, has left residents and professionals asking, "What next?" Light winds, little rain and lots of the explosives make a bad combination for New Year's Eve.